Chocolate Bone Broth Protein: gut health and immune system support; joint protection; healthy metabolism and skin! My favorite part of this hot cocoa? You don’t even need marshmallows because the abundance of collagen in the Chocolate Bone Broth Protein forms a nice sweet frothy layer upon blending. Blissed Out Hot-Hot Cocoa is ideal for diabetics, as the net carbohydrates are a mere 4 grams and the protein…wait for it… as much as a 3-ounce chicken breast! There’s also plenty of healthy fat for added blood sugar control! Add all ingredients to your blender and blend for 10-15 seconds. Top with a sprinkle of cinnamon and enjoy! I love it when I try a nutritionally-upgraded recipe that tastes so good, I actually end up preferring it to the real thing. I like pumpkin pie, but I can take or leave the crust…it’s really the filling I’m after. 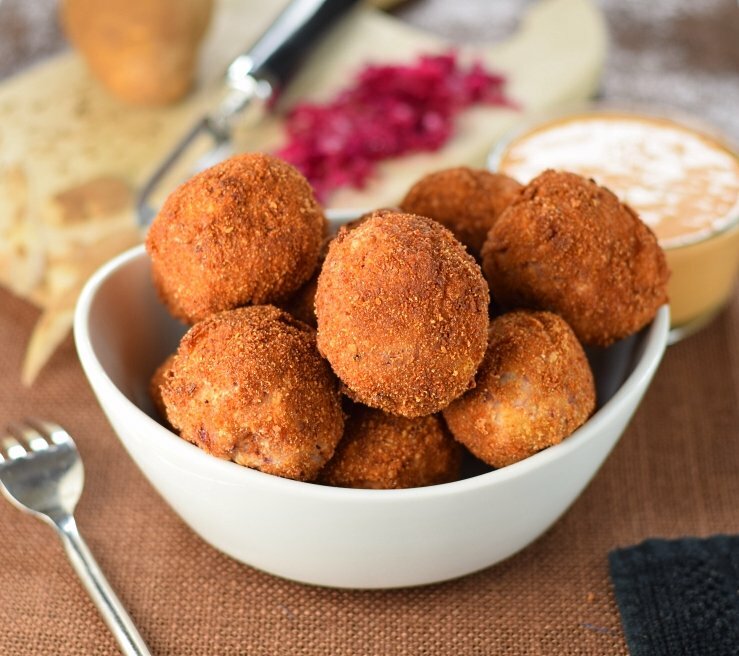 Thank you London from www.evolvingtable.com for this amazing recipe for No-Bake Pumpkin Pie Balls. I made a batch to take to Thanksgiving dinner because I knew at least one person would appreciate this upgraded version of pumpkin pie. The recipe couldn’t be easier. Made by combining almond and gluten-free oat flours with unsweetened pumpkin puree, pure maple syrup and spices, these little bites of heaven really hit the spot. And because they take a little dive in coconut sugar at the end, what you end up with is a sweet (but not too sweet) treat. Pure maple syrup and coconut sugar are both lower glycemic sweeteners, meaning they are a tad bit gentler on your blood sugar. The recipe couldn't be easier. Made by combining almond and gluten-free oat flours with unsweetened pumpkin puree, pure maple syrup and spices, these little bites of heaven really hit the spot. And because they take a little dive in coconut sugar at the end, what you end up with is a sweet (but not too sweet) treat. 0 Earthfood servings. 1 1/4 cup almond flour Bob's Red Mill is a good one! In a large bowl combine oat flour and almond flour. Add pumpkin puree through vanilla extract and mix until well incorporated, using your hands towards the end to ensure even mixing. In a small bowl combine Coconut Sugar Coating ingredients. Scoop 2 tablespoons of pumpkin pie mixture and roll into a ball. Place in the coconut sugar bowl and roll to completely cover. Place on a large plate and repeat with remaining mixture. If not eaten right away, store uncovered in the very back of your refrigerator.